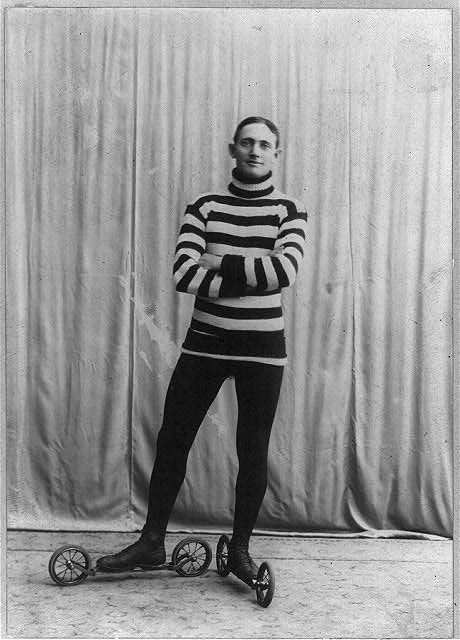 The roller-skating phenomena started in Belgium when inventor John Joseph Merlin created a modified ice skate in 1760, with wheels attached in place of the blade. He’d seen the ease and speed with which expert ice-skaters moved, and looked for a way to make skating available outside of the frozen winter months. Merlin’s roller skates were crudely built, difficult to steer and hard to stop, so they didn’t become very popular, and Merlin never became rich selling them. In 1819, M. Petibled of Paris secured his own patent and gave the shoes on wheels another try, but his prototype wasn’t much better and only enjoyed limited popularity. The real roller skate craze started in 1863 when a Massachusetts man named James Plimpton finally created a practical pair of skates. 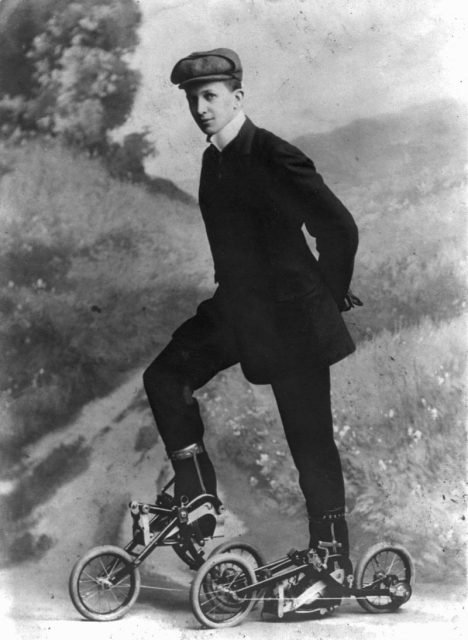 Young man on Edvard Petrini’s pedaled roller skates known as Takypod in Sweden, c. 1910. 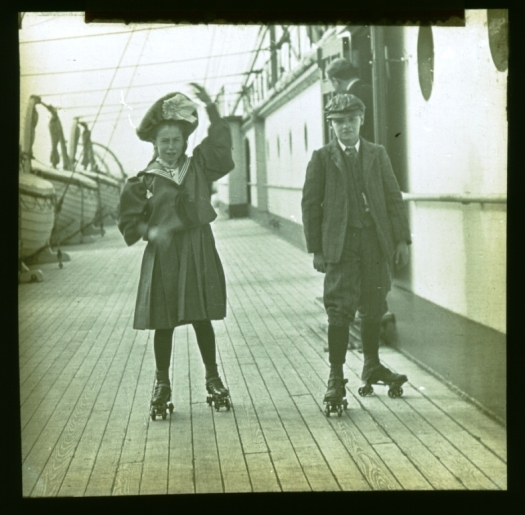 A view of the deck on-board the Mauretania, with a young boy and girl skating along the deck. Before Plimpton, roller skates had simply been built by attaching wheels to the stiff bottoms of wooden shoes. It was a rough and bumpy ride for the skater, especially since there was no way to steer or to stop while skating. Plimpton solved this problem by attaching the wheels to springy carriages to create what he called the “rocking” skate. 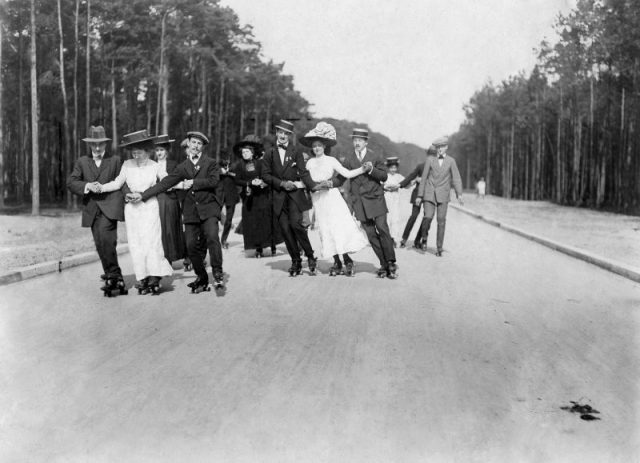 Roller skates in the United States, c. 1905. 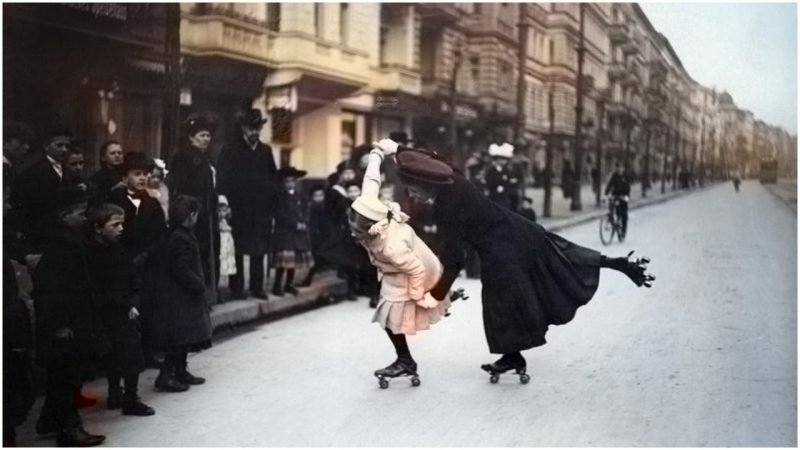 Roller skating on the veranda, 1909. 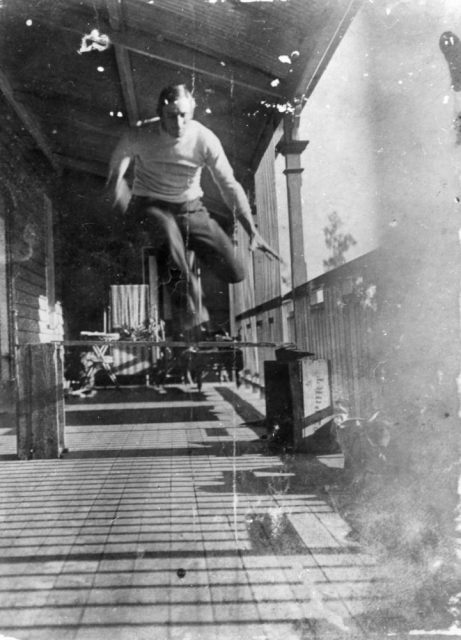 Jumping over a wooden bar. 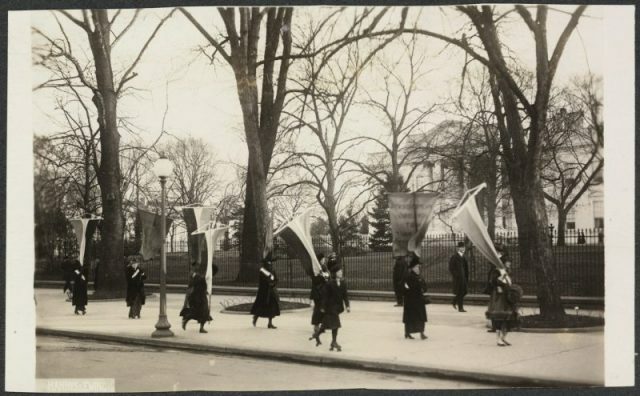 Silent Sentinels of Maryland picket the White House for suffrage in early 1917. 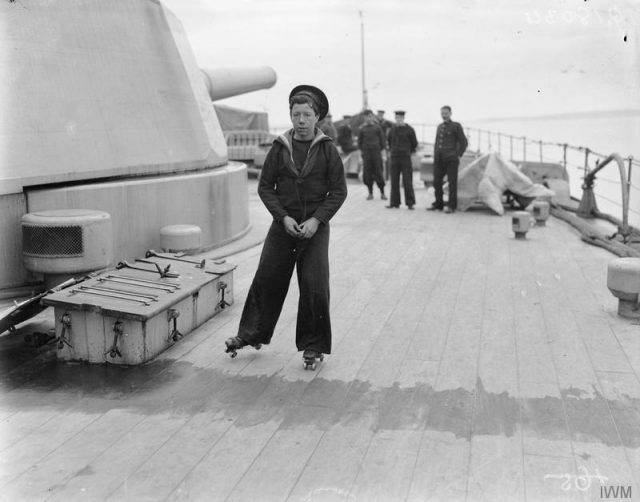 The Royal Navy during the First World War. This spring action feature of Plimpton’s skates took the teeth-clattering roughness out of the skater’s experience and enabled them to change direction by leaning to one side or another. 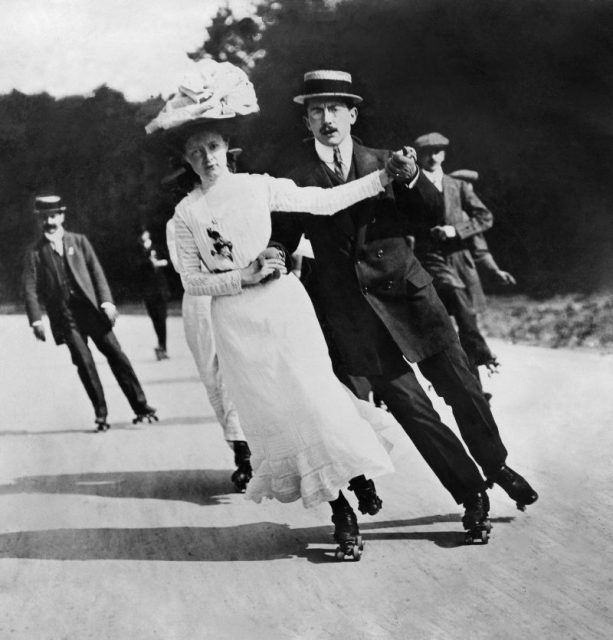 This made Plimpton’s skates (called “quads”) much more popular, and by the turn of the century, recreational skating was on a roll in the United States and in Western Europe. 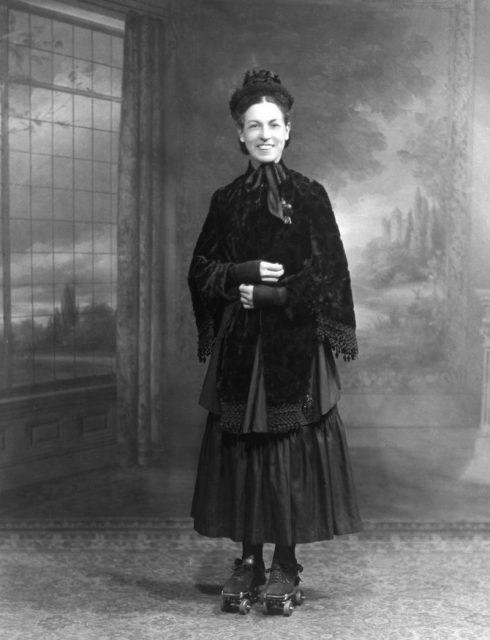 As skating became more popular, roller skates gave way to spin-off inventions like the skateboard, roller blades and even tennis shoes that doubled as roller skates. By the 1980s, skating rinks became one of the coolest and most popular hangouts for children, teens, and young adults. Some drive-in restaurants even employed roller skating waitresses as a part of their unique branding strategy. Today, skating is bigger and better and faster than ever, being featured in sports and recreational activities all over the world, from figure skating to speed racing to roller hockey, to roller derby and even roller ballet.